Senior AICC leader AK Antony will reportedly apprise Rahul Gandhi of the developments in the Congress Legislative Party's (CLP) meet in Bhopal on Wednesday. Antony will fly down to Delhi from Bhopal to update Rahul and thereafter the Congress chief will take a final decision on the name of the next Madhya Pradesh chief minister. Meanwhile, reportedly most of the MLAs in the meeting with the central observers backed Kamal Nath's name for the CM's post. Congress spokesperson Shobha Oza, in a press conference on Wednesday evening, said that the Congress president Rahul Gandhi will decide on the name of the chief minister of Madhya Pradesh. Earlier the Congress legislative party had met with the newly elected MLAs to discuss on the CM face. Reportedly, senior AICC leader AK Antony also held a one-on-one meeting with each of the MLAs. According to CNN-News18, Madhya Pradesh Congress leader Jyotiraditya Scindia has proposed senior leader Kamal Nath's name for the chief ministerial post in the state after a meeting with the Congress Legislative Party (CLP) in Bhopal.The formal annoucement of the new chief minister's name will reportedly take place at 9 pm on Wednesday. According to ANI, a one-line proposal has been passed at the Congress Legislature Party (CLP) meeting in Bhopal. The High Command will now take a decision on the chief minister face. As he and state party chief Kamal Nath are in the race for the chief ministerial post in Madhya Pradesh, Jyotiraditya Scindia expressed his willingness to accept the top post. "Of course, it will be a privilege," replied Scindia to a media query on if he would like to hold the top post. Rahul, while addressing a public meeting in Ujjain during poll campaign, had said that within 10 days of the elections, the new chief minister of Congress party will waive off the loans of farmers in Madhya Pradesh. 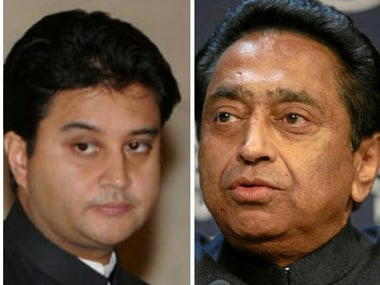 Young gun Jyotiraditya Scindia or old war horse Kamal Nath- who will Rahul Gandhi chose? Although top Congress leaders including Digvijaya had been saying that the elected party members would finalise the chief ministerial candidate, it's a well-known fact that Congress chief Rahul Gandhi will take the final call. While the choice will primarily revolve around old war horse Kamal Nath, the decision will depend a lot on the calculations of Rahul, keeping the 2019 General Election in mind. He will want to flaunt a dynamic young team with leaders like Jyotiraditya Scindia to the nation, besides looking for experience to navigate complicated coalition politics. Kamal Nath or Jyotiraditya Scindia, who will take over the reins of MP? Kamal Nath's candidature is the strongest for the top spot even though Jyotiraditya Scindia's name has also been in circulation. On Wednesday, outside the Raj Bhawan, when the Congress leaders went to meet the governor, the supporters of Nath and Scindia raised slogans for chief ministership in favour of their respective leaders. Although the Congress, in Madhya Pradesh, put up a united fight by keeping differences aside, the supporters of Nath and Scindia have now come out aggressively in public by openly demanding their respective leaders become chief minister — as if differences exist between the two leaders. In the legislative party meeting at 4 pm today, the elected candidates in discussion with All India Congress Committee (AICC) leaders including senior leader AK Antony will finalise the chief ministerial candidate. Given the situation, Congress will look for a chief minister with a lot of experience, who can manage the strong Opposition in the Assembly and simultaneously play a pivotal role in maximising the party's tally in Madhya Pradesh in the 2019 General Election. Madhya Pradesh's BJP chief Rakesh Singh, while speaking to media, said: "We have decided that we should leave some things for the future, which is why Shivraj Singh Chouhan resigned." The leader was referring to earlier reports of BJP staking claim to form the government with the support of Independents. Mayawati's BSP, SP and Independents have declared their support for Congress. The Madhya Pradesh unit of the Congress on Wednesday tweeted out a map of India, with the previously BJP-led states of Rajasthan, Chhattisgarh, and Madhya Pradesh now portrayed in Congress colours. In the tweet, the party called on Prime Minister Narendra Modi and said: "This is the public... they do not make noise but make the right decisions at the right time." Referring to the Congress' sweeping win, the tweet said, "this is good winning over evil, light winning over darkness,"
Jyotiraditya Scindia was a little more forthcoming about chief ministerial ambitions now that the decks are clear for Congress to form the next government in Madhya Pradesh. A disciplined worker and senior politician, Scindia has usually dodged questions when confronted with questions about whether or not he will be the chief minister of Madhya Pradesh. However, now the state safely in tow, Scindia did let on that he is up for the job, should the Congress president offer him the responsibility. "Yes it will be my privilege," replied Scindia when CNN-news18 sought his response if Rahul Gandhi asked him to take up the responsibility. Jyotiraditya Scindia said that he was happy with the way the Congress party performed. "I always knew that we will make it to the majority mark and we will form the government. But yes I also congratulate the BJP for the 109 MLAs that they got; they gave us a good fight," Scindia said. He also said that pre-poll animosity apart, he would like to see the two partie work together for the people's good. Madhya Pradesh govrenor Anandiben Patel said that she held a meeting with Kamal Nath and Jyotiraditya Scindia on Wednesday. Patel said that she has accepted the letter of support and asked the Congress party to elect the leader of the legislative party. The Congress will reveal the name of its chief minister in Madhya Pradesh on Wednesday evening. The party will hold a meeting of party MLAs at around 4 pm. Senior Congress leader AK Antony will be present at the meeting as an observed following which Rahul Gandhi will be informed about the proceeds of the meeting. A meeting between former chief minister Shivraj Singh Chouhan and Kamal Nath has been scheduled for 1 pm today, and the Congress is expected to make an announcement on the new chief minister of Madhya Pradesh shortly after that. "Ab mein mukt hoon, I am free. I have tendered my resignation to the honourable Governor. The responsibility of defeat is totally mine. I have congratulated Kamal Nath ji," Shivraj Singh said. The fact that Mayawati lent support to Congress at a time when it had already made alternate arrangements to reach the majority mark says loads about the Congress-BSP relationship. The BSP supremo has no qualms in publicly discussing her disdain or the grand old party. We came to know that despite a defeat, the BJP was trying to get to power through jod-tod ki rajniti. Our aim is to keep BJP out of power and that is why we are supporting the Congress, despite our misgivings and reservations. "BJP setrast janata ne apne dil pe patthar rakh ke votes diyen hai Congress ko (people were so desperate to remove BJP, that they felt compelled to vote for Congress)," she said. BSP supremo's press conference was loaded with messaging for the 2019 Lok Sabha elections: One, she will not readily come to the negotiation table unless a respectable share is offered to her. And two, that she will not carry with her the burden of Congress' past mistakes. According to latest reports, Madhya Pradesh Congress leader Kamal Nath could be the Chief Minister of Madhya Pradesh. News18 reported that in a show of unity, other Congress leaders who were in the fray, including Jyotiraditya Scindia, have reportedly supported the move. Madhya Pradesh chief minister of 15 years has resigned from office as his party failed to get a clear mandate in elections. "I bow before the people's mandate. We did not get majority so will not stake claim to form government. I am going to tender my resignation to the Governor," Chouhan said. He also congratulated Kamal Nath for the Congress party's performance in the state. After Bahujan Samaj Party supremo Mayawati, Akhilesh Yadav too has said that the lone Samajwadi Party MLA will support the Congress government. The Congress, which won 114 seats had already roped in the support of four Independents and crossed the majority mark. With BSP (4) and SP (1) , the alliance will now have 122 seats, well above the BJP's 109. Madhya Pradesh chief minister of 15 years will resign from office within moments now as his party failed to get a clear mandate in elections. "I bow before the people's mandate. We did not get majority so will not stake claim to form government. I am going to tender my resignation to the Governor," Chouhan said. A Congress delegation will meet Governor Anandiben Patel in Bhopal at 12 pm and stake claim to form a government in Madhya Pradesh. The party had written to the governor last night seeking time for a meeting, amid reports that the BJP too was trying to collect the numbers. However. the governor agreed to meet the party leaders today at 12 pm. Mayawati said results show that people in states like Chhattisgarh, Rajasthan and Madhya Pradesh were totally against the BJP and its anti-people policies and as a result chose Congress due to lack of other major alternative. "The voters chose Congress with a heavy heart because they did not have a strong alternative," she said. Mayawati said that the BSP is the only party that fights for the poor and the Dalits but they failed to get a sufficient number of seats. She, however, did go on to support the Congress becasue she was "principally against BJP". The Bahujan Samaj Party has agreed to support the Congress 'despite its misgivings', says Mayawati. BSP sources said that since the party was principally against a BJP government, it has decided to support the Congress government. Mayawati said results show that people in states like Chhattisgarh, Rajasthan and Madhya Pradesh were totally against the BJP and its anti-people policies and as a result chose Congress due to lack of other major alternative. CNN-News18 reported quoting sources that the Bahujan Samaj Party has agreed to support the Congress 'despite its misgivings'. The news channel quoted BSP sources as saying that since the party was principally against a BJP government, it has decided to support the Congress government. Following the close-run contest in Madhya Pradesh, senior BJP functionaries responsible for BJP's campaign in Madhya Pradeh are in a huddle at Chief Ministre Shivraj Singh Chouhan's residence. Leaders like Kailash Vijayvargiya, Rakesh Singh, Vinay Sahasrabuddhe and Narendra Singh Tomar are present at the chief minister's residence in Bhopal. Omar Abdullah was all praise for Congress president Rahul Gandhi for his "great success in these elections." "He took the blame and the brickbats for all the set backs & now deserves the credit for these victories. It was nice to have something to celebrate on counting day," Omar tweeted. For the BJP, however, Omar had a piece of advice: That it can't shield Modi from the blame becasue he was the party's face and a key campaigner. He also used the occasion to take a swipe on the BJP appointed governors, using the Jammu and Kashmir incident. "Congress leaders aren’t faxing their letter to Raj Bhavan in Bhopal. Smart people. It may be a similar model to the one in Jammu." BJP Spokesperson Syed Zafar Alam said that an element of fatigue was there which may have lead to the party's defeat. "But we can't say anti-incumbency was there because our chief ministers were very popular. Whatever went wrong we will work on it," he said. Speaking to CNN-News18, Congress leader Kamal Nath said that while BSP and SP are yet to confirm their support, the four Independent MLAs are in touch with Congress and have promised their support. The Congress party has called a meeting of its newly elected MLAs on Wednesday evening. The newly-elected MLAs are likely to elect the party's chief ministerial face in Madhya Pradesh. Kamal Nath on Wednesday revealed that the Indian National Congress has been in touch with the four Independent MLAs since yesterday. He said that while the Samajwadi Party and the Bahujan Samaj Party has not given a confirmation yet, the support of the Independents will be sufficient to get them to the majority mark. The Bharati Janata Party lost out its bastion of 15 years to the Congress party. The state which had elected the saffron party with an undisputable majority in the last polls, this time around was undecided as several seats were won by a margin of less than one percent vote. The difference in seat share is also less pronounced as is often observed in the state. The counting has finally come to an end in Madhya Pradesh after it began 24 hours ago and the Congress has emerged as the single-largest party with 114 seats, just two short of the majority mark in the 230-seat Assembly. The party is likely to get support from the Samajwadi Party, which has one seat, but the Congress would still need support of one more MLA. It could either reach out to one or more of the four MLAs, or it can persuade Mayawati to lend them support. The BSP has bagged 2 seats in the state. The final result of the Madhya Pradesh election is out. The Congress has managed to win 114, two short of the majority mark. The Bharatiya Janata Party was restricted at 109. Bahujan Samaj Party (2) and Samajwadi Party (1) are the likely kingmakers in the state. Four Independent candidates have also managed to win seats. Media reports have claimed that the Bharatiya Janata Party hasa also staked a claim for government formation in Madhya Pradesh. Times Now reported that the BJP has claimed the support of Independents and other parties to make up the requisite numbers. The saffron party has sought the governor's time. Meanwhile, the Congress, which had sought an appointment with Governor Anandiben Patel last night, is still waiting for a response. The Congress will have to enlist the support of at least one of the four independents and the lone Samajwadi Party (SP) candidate, or the Bahujan Samaj Party to form the next government in the state. As of now, the results for 229 of the 230 seats have been declared. The Congress has won 113 and is leading in one seats. 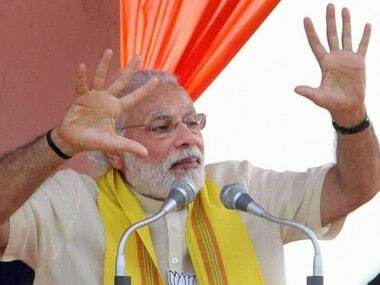 The ruling Bharatiya Janata Party (BJP) has won 109 seats. The Mayawati-led Bahujan Samaj Party (BSP) has won two seats. The Samajwadi Party (SP) has won one seat and Independent candidates have won four. Rahul Gandhi said the congress differs with the BJP ideologically but it does not want to make it a BJP-mukt Bharat, but will work hard to fight it ideologically. He said that with a resurgent Congress party in the states and the combined opposition, it was going to be "very difficult" for Prime Minister Modi and the BJP to win future elections. Observing that the Assembly election results in five states were a referendum on Prime Minister Narendra Modi, Congress President Rahul Gandhi on Tuesday said opposition parties would unitedly fight and defeat the BJP in 2019 elections with the central themes being unemployment, agrarian distress and corruption. “I was telling my mother that the absolute best thing for me was the 2014 election. I learnt a lot from that election. I learnt that the most important thing is humility," said the Congress chief, who took a lot of the blame for the party's earlier election defeats. After losing three states in the Hindi heartlans, BJP's core base, Prime Minister Narendra Modi had a word of advice for his party workers. Praising them for their hardwork, "The family of BJP Karyakartas worked day and night for the state elections. I salute them for their hard work. Victory and defeat are an integral part of life. Today’s results will further our resolve to serve people and work even harder for the development of India." Accepting "people's mandate with humility", Prime Minister Narendra Modi on Tuesday congratulated the Congress, Telangana's K Chandrashekar Rao and the Mizo National Front for their respective victories and said and added in a philosophical vein that it is a part of life. Modi took to Twitter late on Tuesday night after BJP's poll drubbing in three states, two of which were called its bastion. 0.1 per cent - that’s how close the race is between the BJP and the Congress in Madhya Pradesh after more than 21 hours of counting. Congress’ wins ( including latest leads) is at 115, just one short of the magic number 116 in a 230 member Assembly. The Governor’s going to wait until the Election Commission puts its official stamp on the results. Wednesday's MP politics promises to be busy, long and incredibly exciting. The Madhya Pradesh all-nighter has almost ended and at least four of five states that went to the polls in the fag end of 2018 will have brand new chief ministers. Of these states, three are plum in the Hindi heartland. 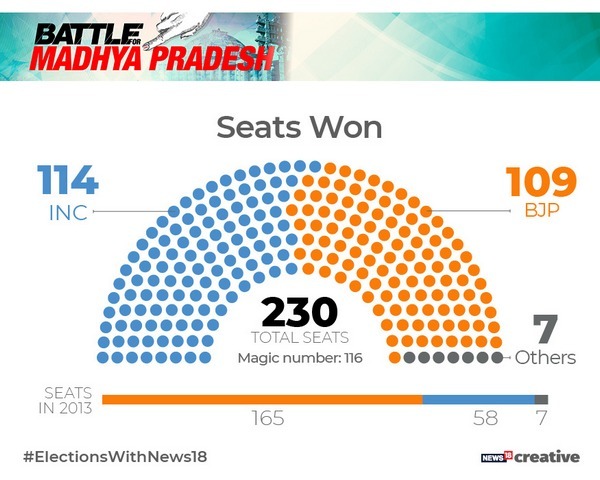 As things stand at around 5 am IST, Congress has won 115 seats in Madhya Pradesh —that’s one short of a majority in the 230 member Assembly. In Rajasthan and Chhattisgarh, Congress has a bigger margin over main rival BJP. Sachin Pilot and Ashok Gehlot are front-runners for the CM post in Rajasthan, Kamal Nath and Jyotiraditya Scindia in Madhya Pradesh. Four names are in the mix for Chhattisgarh. In MP, which is going down to the wire, Congress sent a letter to Governor Anandiben Patel seeking time to stake claim to form the next government. Patel turned down the request and asked the party to wait until results for all seats are declared by the Election Commission. News18 Madhya Pradesh is reporting that a BJP leader is claiming the party is in talks with independents even as Congress inches forward to majority - the 116 mark. Congress has bagged a total of 115 seats, BJP has 108 at last count and independents are front and center in political math. Counting is on in exactly 12 constituencies as of 3 am IST. BJP leads in 6, Congress in 5 and BSP is ahead in Bhind. Congress 114, BJP 107, Others 1 - that’s what it looks like in Madhya Pradesh at 2 am IST. Counting is almost through, Twitter handlers for Rahul Gandhi and the rest are getting some shut eye before the real excitement of political closure that will play out on Wednesday. A quick recap of other results: Congress party is poised to form the government in Rajasthan and Chattisgarh, while TRS scored a big win in Telangana and MNF defeated Congress in the Northeast. As BJP and Congress fight it out in Madhya Pradesh, Governor Anandiben Patel has responded to a Congress letter saying she will take a decision only after the Election Commission greenlights the results. Congress and BJP are headed for a photo finish in Madhya Pradesh. Congress has been asked to wait after seeking an appointment with the Governor to stake claim. * All data here from Election Commission. Madhya Pradesh results and trends Wednesday 12:55 am. Congress has been asked to wait after seeking an appointment with the Governor to stake claim. Madhya Pradesh BJP general secretary VD Sharma accuses Congress of being in a hurry. "They should wait, when the final results come," Sharma said speaking to ANI. "BJP will be the one with the majority." The governor has declined the Congress' request for a late night appointment, saying it will be given only after the situation is made clear by the Election Commission, ANI reported. Congress is also leading in 96 seats while BJP is leading in 92 so far. Other candidates have won two seats while others are leading in 8. Terming the BJP's poor performance in the Assembly elections held in five states the "people's verdict", Trinamool Congress chief and West Bengal chief minister Mamata Banerjee said on Tuesday the poll results were a real democratic indication of the 2019 general elections. "People voted against BJP. This is the people's verdict and victory of the people of this country, victory of democracy and victory against injustice, atrocities, destruction of institutions, misuse of agencies, no work for poor people, farmers, youth, Dalits, SC, ST, OBC, minorities and general caste," she tweeted. The Congress is surging ahead of the BJP in Madhya Pradesh in 115 seats in a bitterly fought contest. The Congress has once again inched towards the halfway mark, 15 ahead of the BJP, according to current trends. However, the trends are unlikely to solidify just yet as there are at least 30 seats where the margin is let than 1,000 votes. After 03:30 pm update by Election Commission, BJP candidate Akash Vijavargiya, son of BJP's General Secretary Kailash Vijavargiya, is trailing in Indore 3 constituency with over 1600 votes. Till 02:30 pm Akash was leading with 99 votes against Congress candidate Ashwin Joshi. With roughly eight rounds of counting still left, the BJP supporters have decided to put up a spirited show. The party workers were seen distributing sweets and raising slogans at the Madhya Pradesh BJP office. This is the first time since morning the BJP supporters gathered at party headquarter and raised slogans. CNN-News18 reported that Congress is still saying that they will form government on their own. But the senior leadership has started sending out to feelers to the smaller parties to prevent the BJP from doing a Goa on them. The Samajwadi Party and Bahujan Samaj Party are considered more inclined towards Congress in event of an alliance government. Madhya Pradesh chief minister Shivraj Singh Chouhan's brother-in-law and Congress candidate Sanjay Singh Masani is in the fourth place in Waraseoni constituency of Balaghat district. BJP' s Yogendra is leading with 37.69 percent votes, Indepent candidate Pradeep with 36.47 percent votes is at the second spot. BSP's Ramkumar has so far recieved 9.41 percent votes and Masani recieved 8.21 percent votes. With trends indicating that the Congress was ahead in the Assembly polls in three Hindi heartland States, senior party leader Jyotiraditya Scindia said the figures reflected the people’s desire for a change. According to initial rounds of counting, the Congress was ahead in Madhya Pradesh, Chhattisgarh and Rajasthan — the three States where the BJP has been in power. Jubilant by their party's good performance in state polls, Congress workers were seen celebrating outside party offices in other states. On person was seen twerking on the dhol tune, displaying an unusual kite flying step. Gulzar Singh, Senior Gondwana Gantantra Party leader, stated that, his party is hopeful of winning the Amarwada constituency inChhindwara district and the Baihar constituency in Balaghat district. When asked that if his party will lend support to either BJP or Congress, Singh said,"We are holding a crucial meeting in Bhopal on Tuesday night, where all party leaders will decide the future plans." Ambah (SC/ST) constituency in Morena district has witnessed the most volatile contest till now. In the morning, Neha Kinner started with a lead, further Kamlesh Jatav of Congress picked up a lead around 10:30 am. Around 11:30 AM Neha Kinner, the state's only transgender candidate made a comeback, however Kamlesh Jatav is leading right now at the seat. Likewise, Damoh, one of the prestigious constituency of Madhya Pradesh, where two political stalwarts Finance Minister Jayant Malaiya and BJP rebel leader Ramkrishna Kusmariya are at loogerheads has also shown substantial swing. In the morning, Ramkrishna Kusmariya started with a lead, but for sometimes Malaiya was also leading the race, but currently Ramkrishna Kusmariya is inching closer to victory. Sanjay Kakade, BJP's Rajya Sabha MP told ANI, "I knew we would lose in Rajasthan and Chhattisgarh but Madhya Pradesh trends have come as a surprise. I think we forgot the issue of development that Modi took up in 2014. Ram Mandir, statues and name changing became the focus." Samajwadi Party extends support to Congress in Madhya Pradesh. As expected, the regional parties have started extending their support to the Congress after trends showed victory for Congress in three states. The Samajwadi Party, which is leading in just one seat, has offered to support the Congress, should it fall short of the majority mark. The Bahujan Samaj Pary too has said that it will not ally with the BJP. The BSP is leading on three seats. The neck-and-neck contest in Madhya Pradesh is partly due to 26 seats where the margin is less than 1000 votes. In fact in two constituencies, Dindori and Gotegaon the winning and the runner-up candidates have a difference of only 50 seats. Nine ministers in the Shivraj Singh Chouhan-led BJP government in Madhya Pradesh are trailing in the Assembly polls as per the latest trends, an election official said Tuesday. State minister Narottam Mishra was trailing by a margin of 3,114 votes from Datia seat while Rustam Singh was at the third position in Morena constituency. Minister Om Prakash Dhurve was at the third place in​ Shahpura seat of Dindori district while Antar Singh Arya was trailing by 3,626 votes in Sendhwa seat in Barwani district. As Bahujan Samaj Party is likely to play kingmaker in state, the party supremo Mayawati has summoned all her candidates to Delhi. BSP party sources have claimed that, Madhya Pradesh assembly Election winners will reach New Delhi in the night or tomorrow to discuss the further electoral probablities with senior leaders. NOTA has so far bagged 1.5 lakh votes which is roughly 1.5 percent of total votes so far. NOTA's vote share so far is more than what the Aam Aadmi Party and Samajwadi Party could muster in these polls. Former Prime Minister's Atal Bihari Vajpayee's relative Anoop Mishra is trailing behind at Bhitarwar constituency of Gwalior district. Lakhan Singh Yadav of Congress is leading at the seat. A significant trend as counting continues in Madhya Pradesh is the leads Congress has taken in the Mahakoushal area. It has swept away the former BJP stronghold. 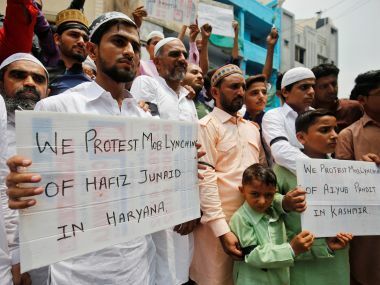 This is the area directly manged by Kamal Nath, who was only one of the two Congress leaders who withstood the Modi wave in 2014, and won the Chhindwara Parliamentary seat. Mahakoushal in the South East of the state has 38 seats of which BJP last time won 24, Congress just 13 and an Independent canddate got one seat. On several Assembly seats BSP gave a tough fight and emerged number two, owing to its popularity in the reserved seats. The fact that Mahakoshal has a lot of tribal seats, and given Congress' leads in the region, it could suggest that the tribals this time in the state have opted for the Congress, News18 reported. Vyapam Whistleblower, Anand Rai says Congress is not in safe zone. Anand Rai, the whistleblower who uncovered the Vyapam scam, stated that the Madhya Pradesh Congress' decision of not forming any alliance in the state backfired for the Grand Old Party. Bahujan Samaj Party, which is leading on 7 seats and Gondwana Gantantra Party, which is ahead on 3 seats will decide the fate of the Congress in Madhya Pradesh. Vishal Jagdesh Patel (Congress) leading by 2,074. The BJP has traditionally managed to secure a win in urban seats consistently. However, this time around, the Congress managed to register a lead in the following urban seats. The BJP has been facing large-scale rebellion from Independent candidates, who failed to get either a BJP ticket, a post or favour from the party. Voters from upper castes and a section of the middle class are perturbed by the SC/ST Atrocities Act, high fuel prices, etc. Mid-level businessmen as well as small- and medium-level farmers who are politically influential have been vocal against the BJP government in Madhya Pradesh. If the current trends persist, this will be the first time that the Congress will cross the 100 mark. Currently it is maintaining a lead on 114 seats out the 230 constituencies up for grabs. In the 2003 Assembly elections, the BJP got 173 seats and Congress 38, Bahujan Samaj Party (BSP) 2 and Samajwadi Party (SP) 7 and Gondwana Gantantra Party (GGP) 3 and others 7 for the 230 members Madhya Pradesh Vidhan Sabha. In 2008, BJP won 143, Congress 71, BSP 7 and Bhartiya Janshakti Party (BJSP) 5. In 2013 BJP won 165, Congress inched 58, BSP 3 and others 4 seats respectively. Of the four assembly constituencies in Mandsaur area, BJP is leading in two including Mandsaur and Malgargarh Assemblies whereas in Garoth and Suvasra areas, Congress is in lead. Hoping to put up a united face, the three Congress chief minister hopefuls (in event of a win), have gathered up. Jyotiraditya Scindia and Digvijaya Singh arrived at Kamal Nath's office in Bhopal, and the trio will head to the Pradesh Congress office together. As the leads on all 230 seats are out, the Congress party was leading in 114 seats, while the BJP had managed to secure leads in 104 seats. The results are a major setback for the ruling party, which held a clear majority in the state in the previous Assembly. Beohari, Amarwada and Junnardeo constituencies of Madhya Pradesh have provided some boost to Gondwana Gantantra Party,. The tribal political outfit is confident of converting these leads into a victory in these seats. The Bahujan Samaj Party also took lead on three seats in Chambal region. The tally of Madhya Pradesh results is changing by the seconds. The latest trends show that the Congress party has managed to overturn BJP's influence on its earlier bastions. The trends suggest the Congress is ahead on 38 seats that were previously held by the BJP. The saffron party on the other hand is likely to llose out on 43 seats it won earlier, if the current trends persist. Unlike former Madhya Pradesh chief minister Digvijaya Singh, there's no anger among voters directly towards Chouhan. While the Congress had faced scores of complaints between 2000 and 2003, there have been no such no large-scale complaints against Chouhan on basic amenities like 'Bijli-Sadak-Paani' (electricity, road and water). The BJP and RSS have played an active role in the state and reached out to the grassroots. The incumbent chief minister has strong support from slum-dwellers and economically weaker sections (EWS) because of the schemes introduced by the state government, especially the Awas Yojna (housing scheme). Even as Congress took the lead in Madhya Pradesh, some senior Congress leaders surprised pollsters by a less favourable outcome. Senior leader Ajay Singh is trailing at Churhat constituency of Satna district. 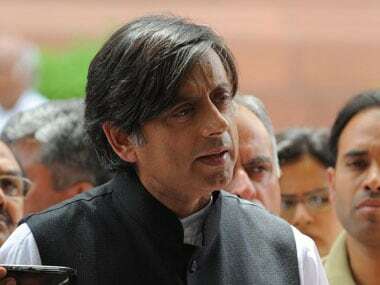 He is pitted against Shardendu Tiwari of BJP. Laxman Singh, brother of former chief minister Digvijaya Singh is also trailing in the early trends. Singh is fighting from Chachaura seat against BJP's Mamta Meena. The Congress took over BJP's early lead with the Indian National Congress forging ahead on 101 seats. The saffron party is close behind at 100. The Congress has taken over BJP's early lead in Madhya Pradesh. The party's final frontier may finally prove to be a handful of urban seats scattered across the state. Just like it eventually happened in Gujarat, if the Congress is kept away from power it would only on basis of BJP’s strength in urban areas. But both parties know that to finally come within sniffing distance of victory Congress should have breached the urban citadel of the BJP – Bhopal, Indore, Gwalior, Jabalpur, and Ujjain. In all these five cities, which are also parliamentary constituencies, have 36 Assembly segments. In a House of 230 seats, this is a huge constituency. In an interesting shift of balance in Madhya Pradesh, the Congress has closed in on the gap in the state. The party is now trailing close behind the BJP with a lead on 94 seats.The BJP on the other hand is ahead on 94 seats. Congress' Atif Aqueel is leading in Bhopal North constituency, a seat from where the BJP fielded its only Muslim face in Madhya Pradesh polls. Ironically, Aqueel is facing a tough challenge from his own party’s senior leader and once rival Rasool Ahmad Siddiqui’s daughter Fatima Siddiqui, who contested on a BJP ticket. Madhya Pradesh Chief Minister Shivraj Singh Chouhan is leading from Budni, with BJP leading in the state so far with a lead on 83 seats, as compared to 73 seats where the Congress is ahead. Congress candidate from Malhargarh, Parshuram Sisodiya is leading with 373 votes, whereas BJP candidate from Mandsaur, Yashpal Singh Sisodiya leading with 463 votes. Meanwhile, Akash Vijayvargiya, BJP stalwart Kailash Vijayvargiya's son is trailing from Indore 3 constituency. Independent candidate Rana Vikram Singh from Susner Assembly in Agar Malwa district is leading in the first round. He was a rebel candidate from the Congress. As the early trends showed the BJP leading in 42 seats, the party office in Bhopal bore a deserted look, with only media persons camping there. Although the party has maintained a lead it is trailing on quite a few constituencies it had held in previous elections. Finance Minister Jayant Malaiya from his traditional Damoh constituency is fighting a tough battle against BJP rebel Ramkrishna Kusmariya, who is now an Independent candidate. Kusmariya holds strong grassroots network, while Malaiya is facing strong anti-incumbency. Small players to play crucial role in Mahakoshal, Bundhelkhand, Vindhya and Baghelkhand segments. Samajwadi Party, Bahujan Samaj Party and Gondwana Gantantra Party likely to remain strong in these regions. However, debutant Aam Aadmi Party could face the heat in Madhya Pradesh election as the established players in Hindi heartland may pose a challenger for the Delhi-based party. .
All eyes on Ambah (SC/ST) constituency in Morena. Neha Kinner, where one of the transgender candidates in Madhya Pradesh supported by SAPAKS is giving tough competition to all major contenders, including Kamlesh Jatav from Congress, BJP'S Gabbar Sakhwar and SP's Satyaprakash Sakhwar. Morena district is bastion of Union Minister Narendra Singh Tomar. Thirty minutes into counting, the Bharatiya Janata Party is leading at 15 seats, while the Congress was ahead on nine seats. Chief Minister Shivraj Singh Chouhan is leading in his home turf Budhni, while BJP leader Yashodhara Raje Scindia is leading from Shivpuri. Congress, meanwhile, took an early lead in Pawai seat. Rajasthan chief minister Vasundhara Raje's sister Yashodhra Raje Scindia in leading from Shivpuri constituency after first round. She was the sports minister in the Shivraj Singh Chouhan cabinet. BJP's Dilip Kumar Makwana is leading in the Ratlam Rural constituency. The Bharatiya janata Party had changed its candiate at the last minute. The party had dropped the sitting MLA Mathura Lal Dabar in favour of Makwana. The first lead in Madhya Pradesh as counting begins was for the Indian National Congress. Party spokesperson Mukesh Nayak has taken an early lead from constituency number 58, Pawai. He is pitted against BJP's sitting MLA Brijendra Pratap Singh. Hiralal Alawa, former Jay Aadivasi Yuva Shakti (JAYS) convenor, contesting a seat from Manawar Assembly constituency, will test his luck against BJP stalwart Ranjana Baghel. Baghel, who has won the past three elections on this seat. The results will decide whether Congress was able to break a strong BJP bastion by giving tribal organisation JAYS by giving a ticket to their leader. The countinghas begun at 8 am with the numbering of postal ballots at 51 centres across the state. The EVMs (Electronic Voting Machines) would be taken up for counting of votes at 8.30 am. Meanwhile, the counting of postal ballots would continue simultaneously. A key contest to watch out for would be ​Hoshangabad, where former BJP minister Sartaj Singh (Congress) is contesting against Sitasharan Sharma (BJP). Bhojpur is seeing a fight between Suresh Pachouri (Congress) and Surendra Patwa (BJP). Bhopal is seeing two Muslim candidates going head to head: Veteran Congress leader Arif Aqueel is pitted against Fatima Siddiqui, BJP's sole Muslim candidate. Detailing the security arrangements on polling day, Bhopal City SP said, "Dedicated teams have been deployed to ensure full security. Diversion points have been put on roads outside the counting centres. There's a 3-tier security system. Any device that can help communication isn't allowed inside the counting centres"
Exit polls have predicted a close race between the BJP and the Congress, though leaders from both parties have routinely claimed their respective victories. Though all exit polls predicted a slide in the BJP's fortunes, some of them have gone to the extent of giving a clear majority to the Congress. The Republic TV-Jan Ki Baat poll has predicted BJP will win 108-128 seats and the Congress 95-115. The India Today-Axis poll gave 102-120 seats to the ruling party and 104-122 to the Congress. Times Now-CNX predicted a majority for the BJP with 126 seats and gave 89 to the Congress. In contrast, the ABP News poll gave the Congress a decisive win with 126 seats and said the BJP would win 94 Assembly constituencies. Akash Vijayvargiya, BJP candidate from Indore 3 assembly constituency and son of party stalwart Kailash Vijayvargiya offered prayers at Sai Baba temple in Nandanagar and also visited a gaushala ahead of counting on Tuesday. He is up against Congress' Ashwin Joshi. The oldest candidate in Madhya Pradesh election is Congress' 78-year-old Sartaj Singh, who crossed over to the party after the BJP denied him a ticket from his traditional Seoni-Malwa seat. Singh was the sitting BJP MLA when the ruling party snubbed him during ticket distribution. He was fielded by the Congress from Hoshangabad seat. Madhya Pradesh Chief Electoral Officer VL Kantha Rao said that 15,000 employees have been drafted for the counting process which will be monitored through 1200 CCTV cameras installed at 51 centres across the state. Madhya Pradesh Chief Electoral Officer VL Kantha Rao said said the maximum rounds of counting — 32 in total — would take place in the Indore-5 assembly segment due to the highest number of booths there. The lowest number of counting rounds (15) would be held in Kotma seat in Anuppur district, he added. Indore-5 seat is currently held by the Bhartiya Janata Party (BJP) while the Congress represents Kotma constituency. Fate of Madhya Pradesh Chief Minister Shivraj Chouhan's bid for his fourth term in office will be known on Tuesday with counting of votes for the state's 230 assembly seats scheduled to begin at 8 am, while the challenger Congress expects to return to power after a 15-year gap. Madhya Pradesh Chief Electoral Officer V L Kantha Rao told reporters that counting would begin at 8 AM with the postal ballots at 51 centres across the state. "EVMs (Electronic Voting Machines) would be taken up for counting of votes at 8.30 AM. Counting of postal ballots would continue simultaneously," he said. BJP's state vice president Sudershan Gupta said that the party will win 140 to 165 seats in Madhya Pradesh and form the government for a fourth straight time under the leadership of Chouhan. "We have received feedback that the BJP will win between 140 and 165 seats and form the government under the leadership of Chouhan for the fourth straight time," Gupta told reporters in Bhopal after a party meeting on Saturday. Kamal Nath is likely to be picked up for the post of the next chief minister of Madhya Pradesh after Jyotiraditya Scindia proposed his name in the CLP meeting. The meeting of the Congress Legislature Party (CLP) is currently underway in Bhopal with senior Congress leader and central observers holding discussions to decide on the next chief minister of Madhya Pradesh. BJP garnered 109 votes in the 230-member strong Legislative Assembly of Madhya Pradesh while the Congress settled at 114 and has staked claim to form the government with the support of Samajwadi Party (SP) that got 1 seat and Mayawati's BSP that bagged 2. Speaking exclusively to ANI, Mayawati said: "Even though we do not agree with many of Congress's policies, we have agreed to support them in Madhya Pradesh and if need be in Rajasthan." Whereas, Samajwadi Party chief Akhilesh Yadav too announced support to the Congress in forming government in Madhya Pradesh. Failing to lead BJP reach the majority mark in Madhya Pradesh, Shivraj Singh Chouhan on Wednesday resigned from the post of chief minister. Chouhan said that since his party lacked the magic numbers in the Assembly polls, he will not stake claim to form the government in Madhya Pradesh. Chouhan on Wednesday visited Governor Anandiben Patel's office to tender his resignation. "I am free now. I have tendered my resignation to the honourable governor. The responsibility of defeat is totally mine. We did not get majority, will not stake claim to form Government. I have congratulated Kamal Nath ji. Na haar mein, na jeet mein, kinchit nahin bhaybhit main, kartavya path par jo bhi mile, yeh bhi sahi woh bhi sahi (I am not scared either in victory or in defeat. I will continue fulfilling my duty irrespective of what I get)," Chouhan told media after his resignation. Expressing his willingness to be the chief minister of Madhya Pradesh, Congress leader Jyotiraditya Scindia on Wednesday called upon the BJP to work in tandem with the Congress for the betterment of the state. Interacting with the media after the Congress staked claim to form the government in the state, Scindia hoped that the Congress tenure will not be marked with adversarial relations with BJP. "The battle has been fought and it is over. I congratulate the BJP for winning 109 seats. But now we have to look ahead. The next five years must not be adversarial. We must work together with the spirit of working for the betterment of and uplifting Madhya Pradesh," said the Lok Sabha member from Guna. Scindia said it was essential to work in partnership with the BJP to ensure the progress of the state. "You fight a fight during elections and after that we are all are public servants. We are in this engagement to ensure that we make the state, the area we represent, a better place. For that we must work together. The Congress has the support of 121 MLAs in the Madhya Pradesh Assembly, party spokesperson Narendra Saluja claimed on Wednesday. The Congress won 114 seats in the state polls but was two short of the simple majority mark of 116 in the 230-member Assembly. "With the support of BSP's two, SP's one and four independent candidates, the Congress' tally is 121 in the 230-member Madhya Pradesh Assembly," Saluja told reporters at the Raj Bhawan after Congress leaders met Governor Anandiben Patel. Senior Congress leaders, including Kamal Nath, Jyotiraditya Scindia, Digvijay Singh, Arun Yadav and Vivek Tankha, met the governor to stake claim to form the government in the state. "The Congress has emerged as the single largest party with majority support. The BSP, the SP and Independents have assured their support in favour of the Congress," Nath, the state Congress chief, said in a letter to the governor. He further requested the governor in the letter to call the Congress to form the government in the state. Senior leaders and MLAs Jyotiraditya Scindia, Digvijay Singh Kamal Nath and AICC central observers including former defence minister AK Anotny are attending the meeting in Bhopal. The central observers of AICC in Delhi arrived in Bhopal on Wednesday to meet the newly-elected MLAs of the Madhya Pradesh Legislative Assembly. Addressing a press conference, Chouhan said that if the saffron party put up a dismal show in the 2018 Assembly elections, it was due to his shortcomings and failure as a leader. "It must be my fault that we lost the Legislative Assembly elections." Chouhan further added that since the numbers favoured a Congress government in Madhya Pradesh, it was only fair that "I quit." After state unit chief Rakesh Singh, Shivraj Singh Chouhan recounts his term as the chief minister. In an emotional speech, Chouhan said that he was inspired to help the people of the state based on the hardships that he grew up with. Chouhan said he tried his best to serve the people of chief minister. "I congratulate the Congress, and I believe that the Congress will not only take forward the Chouhan government's hard work to bring progress, and will also add more value to those initiatives," said Singh. Former Uttar Pradesh chief minister Akhilesh Yadav, following the Congress' win in Madhya Pradesh, said: "We welcome the mandate. We didn't perform well but we would like to thank the public of Madhya Pradesh for supporting us. We have decided to support Congress in the state." Launching an attack on the BJP, Yadav said that the saffron party "has spread hatred and deceived the public, they will be given an answer in the Lok Sabha elections." Former chief minister Shivraj Singh Chouhan took to Twitter after tendering his resignation, and thanked Prime Minister Narendra Modi as well as BJP president Amit Shah for their "unprecedented support." In his tweet, Chouhan also extended his gratitude to all the party ministers and workers. Jyotiraditya Scindia, after meeting the Governor with senior leader Kamal Nath told CNN-News18 that he is "willing" to take up the responsibility of being the chief minister of the state. " I am willing to take CM responsibility and it will be a privilege if I get the opportunity." "We welcome the verdict in the election. It wasn’t a good result for us but want to thank Madhya Pradesh voters for the votes they have given us," Akhilesh Yadav said. Speaking on the issue of EVM tampering, Akhilesh said, "EVMs have always been in question, even in America. The ballot paper is the best. We'll keep raising this issue." The decks are clear for Congress to form the next government in Madhya Pradesh after three-time chief minister Shivraj Singh Chouhhan Wednesday tendered his resignation to Governor Anandiben Patel. However, the next battle the party faces is from within. The supporters of Jyotiraditya Scindia and Kamal Nath have been engaged in a civil war that manifests itself in weird ways. While Scindia's supporters raised 'Scindia for CM' slogans outside Kamal Nath's residence, there now seems to be a poster war going on between the duo's supporters rushing on to plaster the state's wall with thank you notes and celebratory messages. Thankfully, the suspense is not much long-drawn. We expect Congress MLAs to unanimously pass a resolution leaving the decision on Congress president, as is customary in the party. Henceforth, Rahul Gandhi will chose the candidate he sees most fit to lead the state. And both men, being senior leaders and mature politicians, will ultimately reign in their upset supporters. A happy ending for the Congress. Who got it wrong, who guessed it right? Here's how accurate this year's prediction were. From labelling him a 'BJP stalwart in Vajpayee mould' to the 'people's chief minister', Twitter and political pundits were all praise for Shivraj Singh Chouhan. People commented on the fact how Chouhan set the bar too high for even for his own party colleagues. Once again, by respecting the mandate in MP rather than try a smash-and-grab like Karnataka, @ChouhanShivraj shows why he’s among our most dignified political leaders. He’s a BJP stalwart in Vajpayee mould who nearly pulled off an incredible fourth term. Even in defeat, Shivraj Singh Chouhan was a poignant orator and a graceful runner-up. In his press address following elections, Shivraj set an example other BJP chief ministerial faces have failed to follow in the past. Shivraj's gracefully crafted speech, wherein he not only accepts defeat but subtly points out that the people's mandate was so divided that it wasn't completely against him, is reminiscent of the situation in Karnataka. Despite visibly being the losing party, and a post-poll alliance in place, BS Yeddyurappa took oath as the chief minister of a minority government and then resigned just ahead of the trust vote. The Congress party seemed to have learnt from its mistakes, or rather from BJP's game plan in states, like Karnataka, Goa and Manipur, which threw up Hung Assembly situation. The Congress party seemed to have learnt from its mistakes, or rather from BJP's game plan in states, like Karnataka, Goa and Manipur, which threw up Hung Assembly situation. The party outshone BJP in the post-poll political manoeuvering in MP even though the difference in the number of seats was lesser than it was in Goa, where the BJP managed to form a government. Kamal Nath was prompt to rope in the support of all four Independent MLAs before BJP could touch them. In doing so, he successfully secured the only free radicals in this highly polarised elections. Besides, in doing so, the Congress also sent a message out to the Samajwadi Party and the BSP, who were dilly-dallying over support to the Congress. Nath knew that because these parties are staunchly against BJP on a national stage, they will be doomed if they support the saffron party. He also drove home the point that the Congress will not be held hostage to threats and negotiations, because it is already past the majority mark without these parties' help. Madhya Pradesh Legislative Assembly Latest Updates: According to CNN-News18, Madhya Pradesh Congress leader Jyotiraditya Scindia has proposed senior leader Kamal Nath's name for the chief ministerial post in the state after a meeting with the Congress Legislative Party (CLP) in Bhopal. The formal annoucement of the new chief minister's name will reportedly take place at 9 pm on Wednesday. A one-line proposal has been passed at the Congress Legislature Party (CLP) meeting in Bhopal. The High Command will now take a decision on the chief minister face. In the legislative party meeting at 4 pm today, the elected candidates in discussion with All India Congress Committee (AICC) leaders including senior leader AK Antony will finalise the chief ministerial candidate. Given the situation, Congress will look for a chief minister with a lot of experience, who can manage the strong Opposition in the Assembly and simultaneously play a pivotal role in maximising the party's tally in Madhya Pradesh in the 2019 General Election. Former chief minister of Madhya Pradesh Shivraj Singh Chouhan recounts his term as the chief minister. In an emotional speech, Chouhan said that he was inspired to help the people of the state based on the hardships that he grew up with. Chouhan said he tried his best to serve the people of chief minister. Chouhan further added that since the numbers favoured a Congress government in Madhya Pradesh, it was only fair that "I quit." Reacting to their loss in the state assembly elections, the BJP chief Rakesh Singh said that it was not just BJP, but even Congress did not drum up the required numbers. Congratulating Congress for their performance, the BJP leader said that it is only fitting that the party which has the majority should form the government. Singh also praised Shivraj Singh Chouhan's stint as the chief minister and said, "We were privileged to work under Shivraj Singhji." Former chief minister Shivraj Singh Chouhan took to Twitter after tendering his resignation, and took to Twitter to thank Prime Minister Narendra Modi as well as BJP president Amit Shah for their "unprecedented support." However, the next battle the party faces is from within. The supporters of Jyotiraditya Scindia and Kamal Nath have been engaged in a civil war that manifests itself in weird ways. While Scindia's supporters raised 'Scindia for CM' slogans outside Kamal Nath's residence, there now seems to be a poster war going on between the duo's supporters rushing on to plaster the state's wall with thank you notes and celebratory messages. Thankfully, the suspense is not much long-drawn. We expect Congress MLAs to unanimously pass a resolution leaving the decision on Congress president, as is customary in the party. Henceforth, Rahul Gandhi will chose the candidate he sees most fit to lead the state. And both men, being senior leaders and mature politicians, will ultimately reign in their upset supporters. A happy ending for the Congress. A Congress delegation will meet Governor Anandiben Patel in Bhopal at 12 pm and stake claim to form a government in Madhya Pradesh. Madhya Pradesh governor Anandiben Patel on Tuesday declined the Congress' request for a late night appointment, saying it will be given only after the Election Commission makes the situation clear. The Congress has staked a claim to form the government in Madhya Pradesh and sought an appointment with the governor, saying it had emerged as the single largest party in the Assembly. The grand old party had sought a late night appointment with the governor through fax and email. Madhya Pradesh Congress Committee president Kamal Nath, in his letter to the governor, claimed the party has support of "all independent candidates". Shivraj Singh Chouhan has won from Budhni constituency with a margin of nearly 59,000 votes. Congress president Rahul Gandhi addressed a press conference at the Congress headquarters in New Delhi and said that BJP and Narendra Modi will not be able to win the 2019 polls. The neck-and-neck contest continues in Madhya Pradesh as BJP leads in 109 seats while Congress leads in 111. Dozen ministers in the Shivraj Singh Chouhan government are trailing in an election in which the margin of votes in some constituencies is as low as four. In a bitterly fought contest, the Congress has managed to surge ahead of the BJP in 110 seats and has won eight seats. According to current trends, the BJP is leading on 90 seats and has won 12 others. However, the trends are unlikely to solidify just yet as there are at least 30 seats where the margin is let than 1,000 votes. As Bahujan Samaj Party is likely to play kingmaker in state, the party supremo Mayawati has summoned all her candidates to Delhi. Meanwhile, Gondwana Gantantra Party will also hold a crucial meeting in Bhopal on Tuesday night, where all party leaders will decide the future plans. The tally of Madhya Pradesh results is changing by the seconds. The latest trends show that the Congress has managed to overturn Congress' early lead. BIt even grazed through the halfwy mark briefly but fell down to 115 only moments later. The BJP is trailing close behind with 104 seats. The trends suggest the Congress is ahead on 38 seats that were previously held by the BJP. The saffron party on the other hand is likely to llose out on 43 seats it won earlier, if the current trends persist. The BJP is leading with 435 votes in Mandsaur, the place where the Shivraj Singh Chouhan government has faced massive resistance from farmers. Meanwhile, Akash Vijayvargiya, BJP stalwart Kailash Vijayvargiya's son is trailing from Indore 3 constituency. The counting has begun at 8 am with the numbering of postal ballots at 51 centres across the state. The EVMs (Electronic Voting Machines) would be taken up for counting at 8.30 am. Meanwhile, the counting of postal ballots would continue simultaneously. The Bhopal strong room was opened in presence of the candidates contesting from the seat. The Electronic Voting Machines are now being taken to counting room. On an average, 22 rounds of counting will be conducted here. Madhya Pradesh Chief Electoral Officer V L Kantha Rao told reporters that counting would begin at 8 AM with the postal ballots at 51 centres across the state. "EVMs (Electronic Voting Machines) would be taken up for counting at 8.30 AM. Counting of postal ballots would continue simultaneously," he said. The counting of votes for the Madhya Pradesh Assembly election 2018 take place on Tuesday along with the result declaration of the elections in five other states including Chhattisgarh, Telangana, Rajasthan and Mizoram. The exit polls have predicted an interesting contest in Madhya Pradesh, where the BJP is trying for a consecutive fourth term. According to Times Now-CNX, the BJP is set to pick up 126 of the 230 seats on offer, with the Congress and its allies picking up 89, the Bahujan Samaj Party six and others expected to win nine seats. However, the India Today-Axis My India poll shows the BJP picking up 102 to 120 seats, the Congress claiming 104 to 122 seats and others winning between four and 11 seats. Whereas in a further cause of concern for the incumbent party, the Republic-CVoter survey gives BJP between 90 and 106 seats and sees the Congress walk away with between 110 and 126 seats. The Election Commission has announced that counting will begin at 8 am and postal ballots will be taken up first followed by electronic voting machines at 8.30 am. Of the 5.04-crore registered voters in the state, 3.78 crore (75.05 percent) exercised their franchise. The election for the 230-member Assembly was held on 28 November and as many as 2,899 candidates are in the fray. Also testing their electoral fortunes are 1,094 independent candidates. Chief Minister Shivraj Singh Chouhan, in office since 2005, is seeking re-election from Budhni seat in Sehore district and is pitted against Congress candidate Arun Yadav, a former minister.